Sam and his brave friends must rally to defend Orkney in the final installment of Adams’ (The Red Sun, 2015, etc.) YA fantasy series. Thirteen-year-old Sam has settled into his “witch-boy” life in Orkney, still wracked with guilt that he killed his father, the powerful god Odin, while under the sway of another. When Odin’s wife, Queen Frigga, appears, she carries the message that Odin is in the dangerous underworld and that he must be found—fast. His death has torn the veil protecting Orkney, and the mischief-maker Loki is stirring up civil war in a plot to seek revenge on Odin for cursing his wife and children. But the quest will not be easy: Sam will need his imp friend, Mavery; the spunky witch, Perrin; and his friends Leo, Howie, and Keely if he’s going to accept the challenge. As Orkney prepares for an attack from Surt, lord of the fire world, Sam is given a toy ship that holds more magic than it appears; meanwhile, Keely must convince a king that his people need not go to war, while Howie finds ways to be clever as he stays behind to defend Orkney. The shape-shifting Loki impedes them at every turn, and Sam will be asked to make sacrifices, test his memory, and, above all, forgive himself (“I’m just a kid who found himself making all kinds of mistakes before he figured out who he was”). The overarching feud between Odin and Loki makes a nice framework for a novel that sprawls across multiple worlds, characters, and adventures. Witty dialogue keeps the story buoyant, and there’s also thoughtful worldbuilding, with every colorful setting making the fictional universe more fully realized. There’s also no shortage of captivating magic, from spells to powerful pendants, as well as a variety of mythical creatures. More than 20 characters appear in the first 50 pages, though, so readers should tackle the first two novels in the trilogy first—especially if they want to savor the emotionally tender ending. 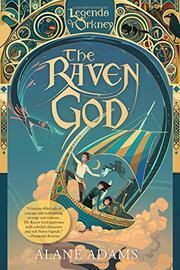 A fast-paced, satisfying capper to a trilogy that’s sure to enchant fans of adventure-driven fantasy.